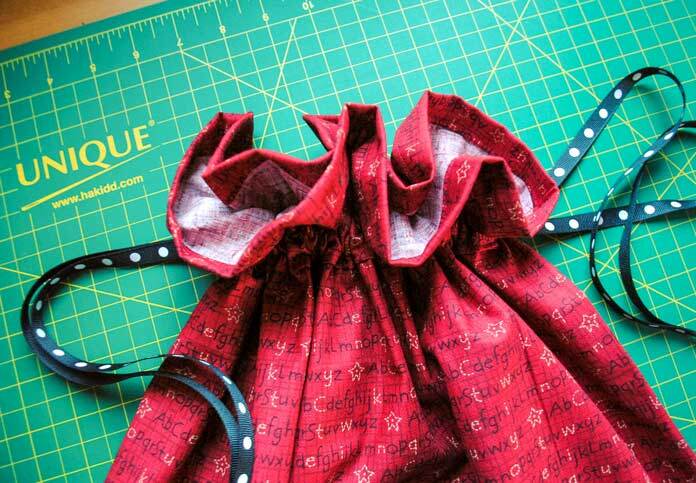 To figure out the length of fabric needed to make each drawstring casing, measure the width of the gift bag and add 1″. 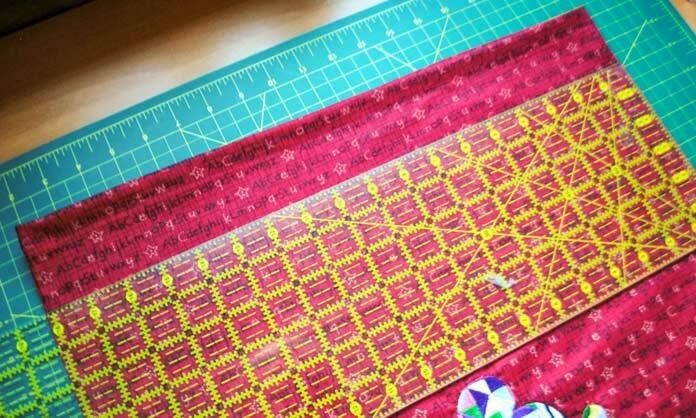 Use this measurement to cut two pieces of fabric 2½” wide. 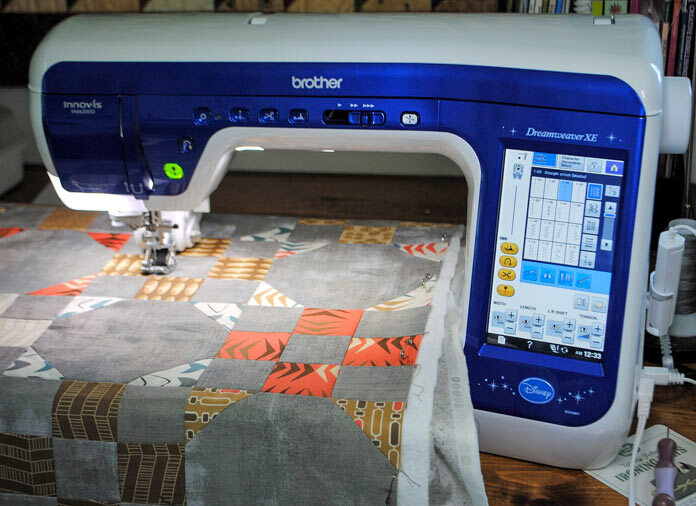 My bag measures 18″ wide, so I cut two pieces of fabric 19″ x 2½”. 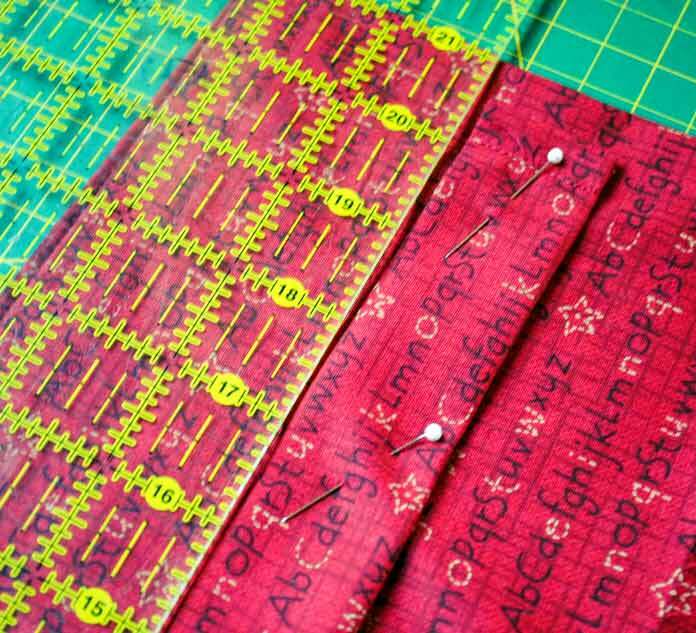 This width of fabric will work well for the the ⅜” ribbon that I’ll be using. 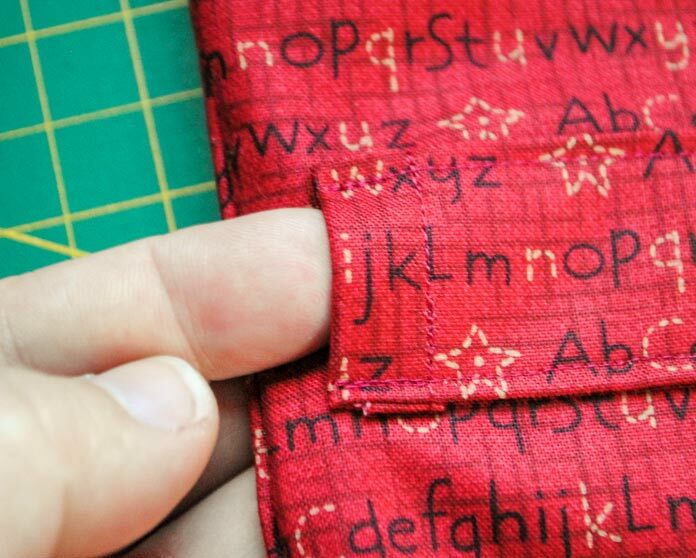 If your ribbon is any wider than ¾”, you’ll probably need to cut your two pieces of fabric a bit wider. 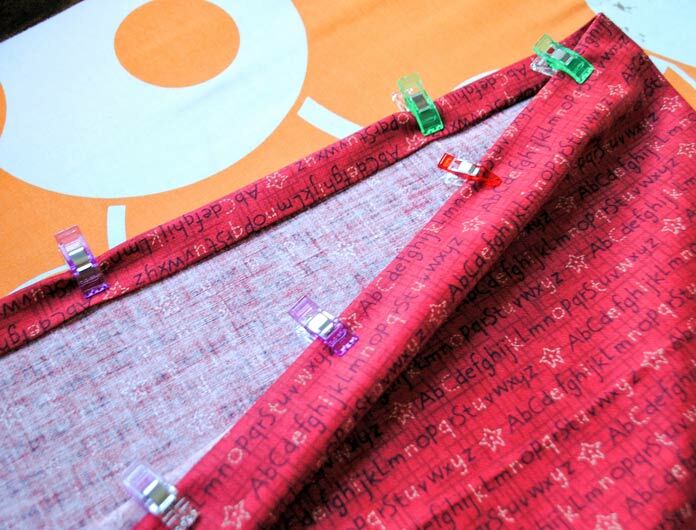 Fold the long edges of the drawstring casing into the middle of the back and press, then fold the two ends over ½” twice and press. Topstitch each end of the two drawstring cases using the “J” foot on the Dreamweaver XE from Brother. Center one casing on each side of the bag, 2¼” down from the top edge and pin in place. 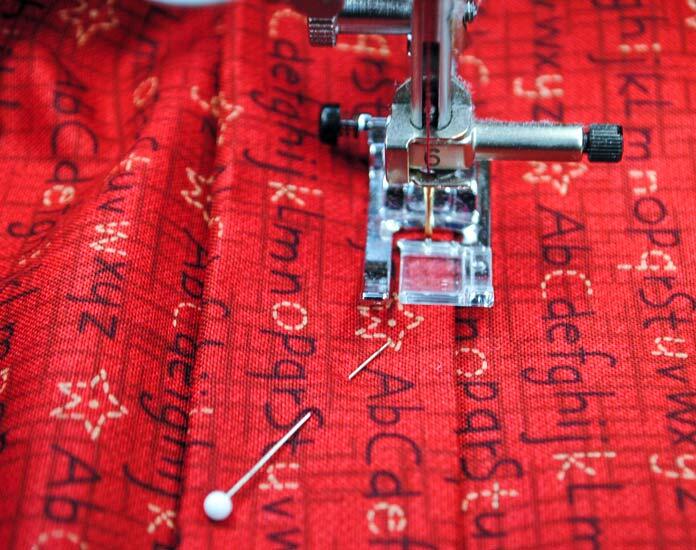 Topstitch along each long edge of the drawstring casings with a narrow seam. Make sure not to catch the other side of the bag in the stitches. 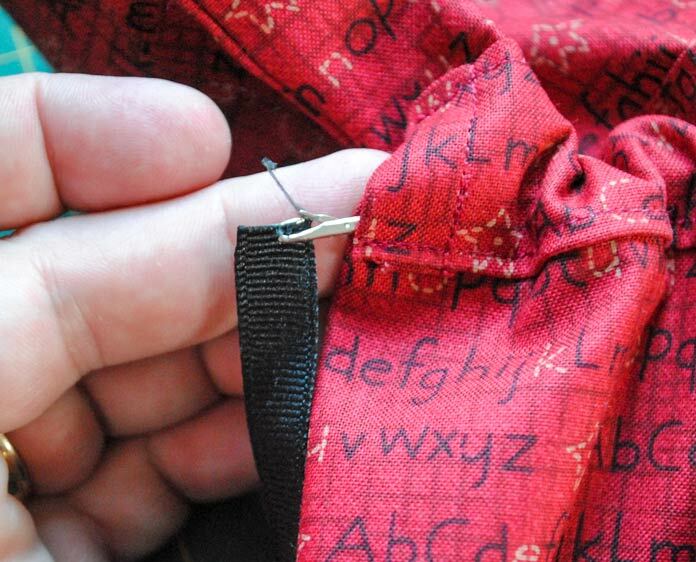 Each end of each drawstring casing should be open to allow the ribbon to be threaded through. 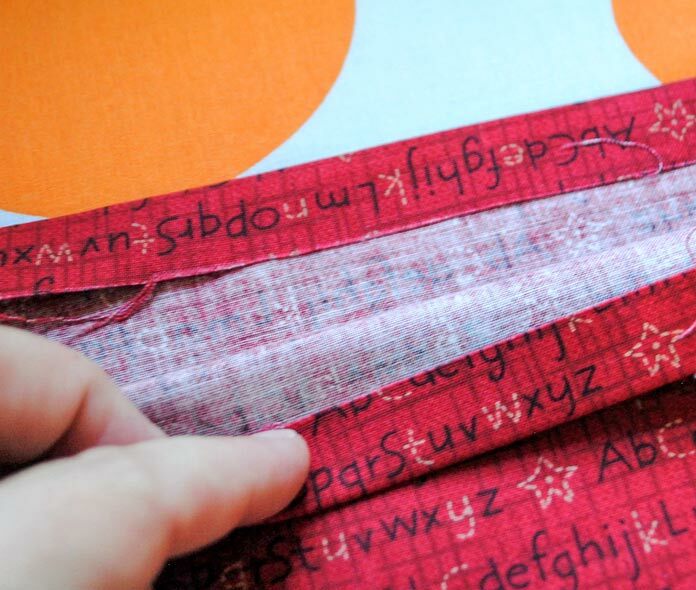 Cut two pieces of ribbon that are twice the width of the bag plus 8″ long. 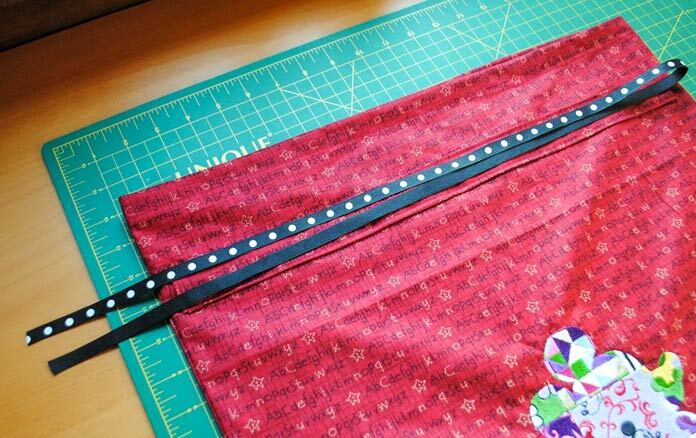 Since my bag is 18″ wide I’ve cut my two pieces of ribbon so that they are each 44″ long (2×18″+8″). I’ll use my very handy UNIQUE loop turner to thread the ribbon through the drawstring casing. I love this little tool! 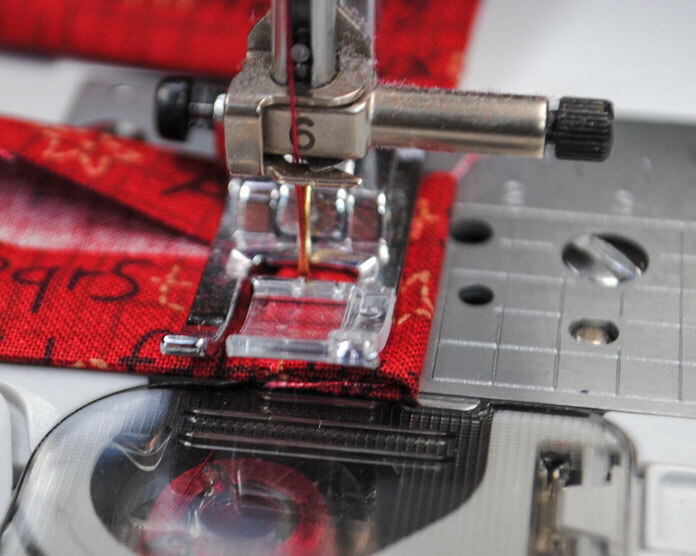 So much easier than using a safety pin hooked onto the end of the ribbon and then pushing it through the casing! Push the loop turner through the casing from one end to the other and then hook the end of the ribbon and pull it all the way through the casing. 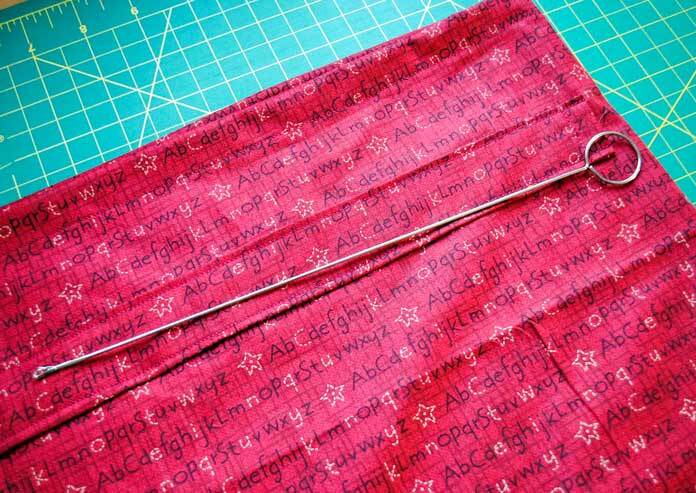 Pull the ribbon through the second drawstring casing (on the other side of the bag) and then knot the two ends together. 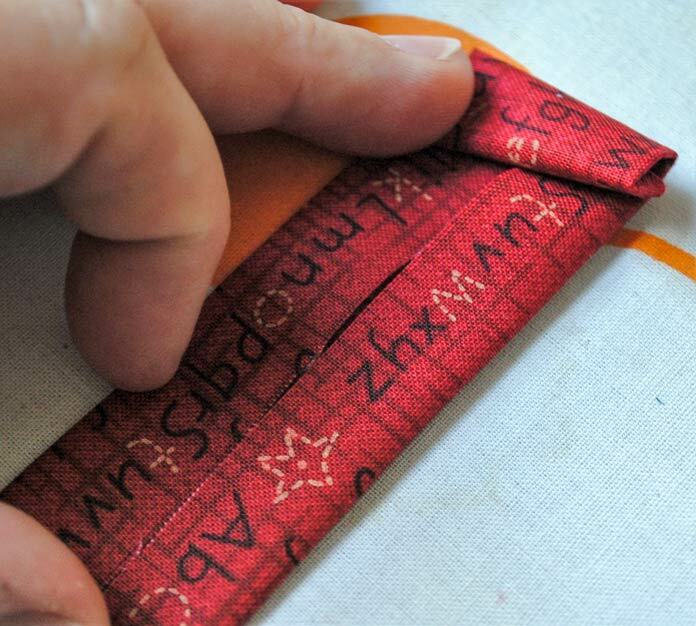 Thread the second ribbon through both casings in the opposite direction so that the two ends of that ribbon are knotted on the other side of the bag. 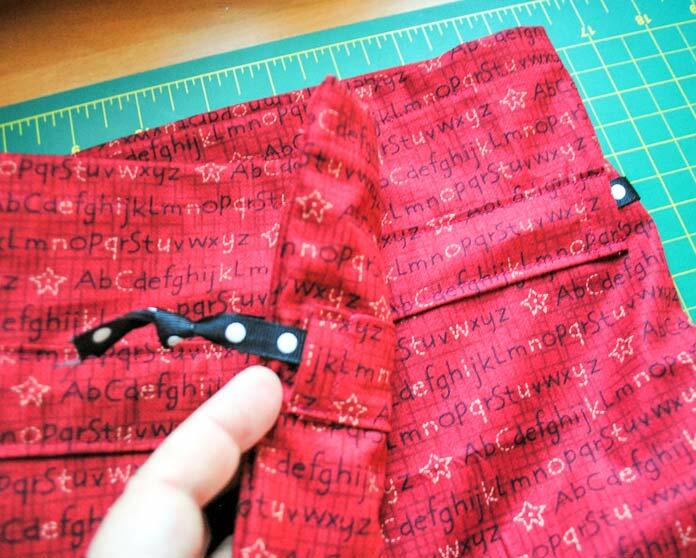 Cinch the drawstring bag by pulling on both ends of the ribbons. 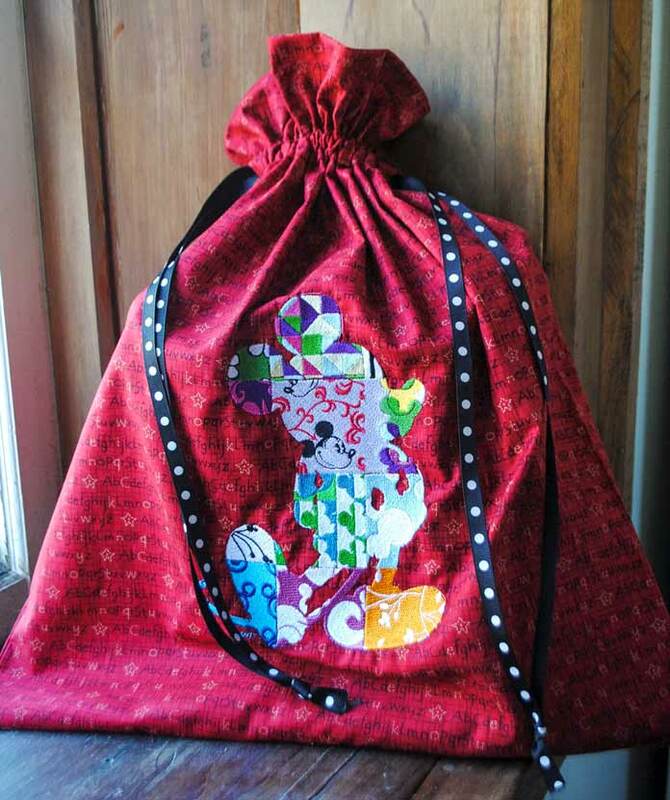 Here’s the finished drawstring gift bag, sewn and embroidered with the Brother Dreamweaver XE. Now that my bag is finished, I don’t know if I’d really want to give it away! Maybe I’ll use it as a shoe bag – it’s just happens to be just the right size. Thanks for joining me this week – I hope you’re enjoying learning about all the great things that the Brother Dreamweaver XE can do. I sure am! See you in a month.